Big Thunder Mountain Railroad is an attraction located in the Magic Kingdom theme park at Walt Disney World Resort in Bay Lake, Florida (Near Orlando, Florida). There are other versions of Big Thunder Mountain railroad at the other Disney theme parks around the world. 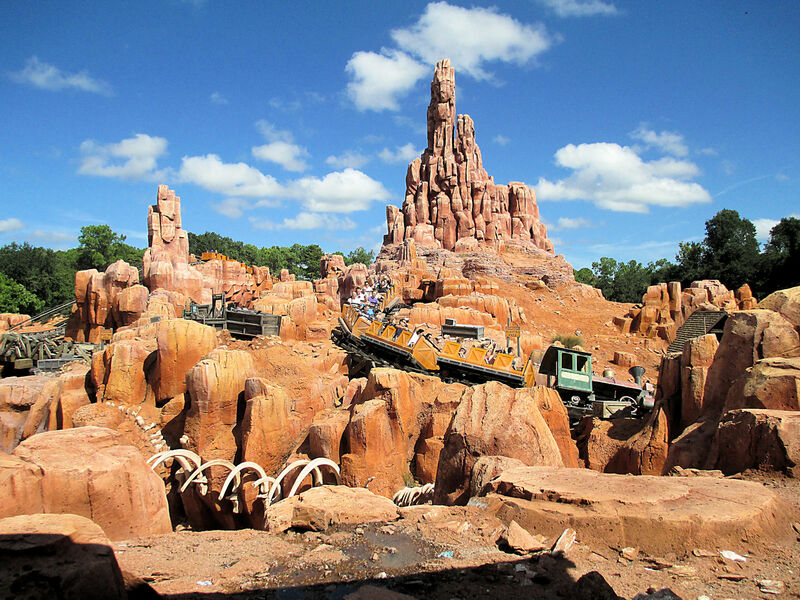 This article and section of the site gives an overview on Big Thunder Mountain Railroad Walt Disney World and does not fully cover the other version at the other parks. Big Thunder Mountain Railroad is a roller coaster that was developed by WED Enterprises for use in the Walt Disney Productions theme parks (now The Walt Disney Company). The roller coaster was developed in the 1970 by Disney Imagineers Tony Baxter, Claude Coats (Both Disney Legends) and Bill Watkins. The first version of the ride was unveiled to the public at Disneyland California on September 2nd, 1979. Following the Disneyland version, Walt Disney Productions designed a version of the ride for Walt Disney World. The version at Walt Disney World’s Magic Kingdom was manufactured by Arrow Development, a company that was frequently contracted to build rides for Walt Disney World. Big Thunder Mountain at The Magic Kingdom opened to the public on November 15th, 1980. Some places are reporting that the ride opened on September 23, 1980, however, November 15th looks to be the correct opening date. Walt Disney World’s Big Thunder Mountain Railroad has been operating in the Magic Kingdom since 1980 and is one of the popular attractions in the theme park. Above is a photo of Big Thunder Mountain Railroad at Walt Disney World's Magic Kingdom. The original photo is by AmaryllisGardener on Wikimedia Commons and the version on this page was modified by NavFile. Photo is released under a Creative Commons License. The attraction is themed to represent an abandoned gold mining town during the American Gold Rush time period. On the Walt Disney World site, the company describes the ride as being modeled after a haunted mine. Also noted on the site is that the time period is set to be in the 1850s. The Walt Disney World version of the ride also seems to focus on being a “haunted mine” and not an abandoned mine. The train that guests ride on is taken over by “ghosts” and becomes a ghost train. The train then takes gusts around Big Thunder Mountain and the mine. Big Thunder Mountain Railroad is the fastest ride in the Magic Kingdom at 35 mph, so the trip around the mountain and mine is experienced at high speeds. The train takes guests through a series of turns and drops around the mountain, which is modeled after a mine in the old west. The ride is specifically modeled after the Monument Valley region in Arizona and Utah. Big Thunder Mountain Railroad does not go upside down during any part of the ride. There are actually no rides in the Magic Kingdom that go upside down. The ride starts in the loading area which is modeled after an office in mine. From the loading area you then travel up the inside of the mine/mountain to the top where the ride makes its way back down through a series of fast turns. From the bottom, the ride then goes up another incline to the final portion of the ride. The train then takes guests back down again through turns and mini drops (bumps). The train then returns to mine office / train station, where guests then exit the ride. Full coverage of the track layout and turns can be found on our track layout page (arriving soon). Big Thunder Mountain Railroad can be considered to be less “scarier” than Space Mountain. There are no big drops on the ride, in fact, we do not consider there to be any real drops on the ride. Space Mountain does have drops, however, in comparison to other roller coasters, they are not that big. The ride on Big Thunder Mountain Railroad is “rough” as the roller coaster is the fastest ride in the park and takes guests through tight turns and mini drops at “fast” speeds. The ride is more “rough” than Space Mountain. We also consider the ride to be less “scary” than Splash Mountain. Splash Mountain has the biggest drop in the park, which can be scary for many guests. Big Thunder Mountain Railroad in Walt Disney World is one of our must ride attractions. Basically if the ride has a mountain or a mine, it is usually a top ride in the park. To learn more about Big Thunder Mountain Railroad please feel free to visit the other pages about the attraction here on the site. Location: Frontierland at the Magic Kingdom Theme Park, Walt Disney World Resort, Bay Lake, Florida (Near the Orlando, Florida area). Speed: 30 to 36 miles per hour (mph) See our speed page for more information. 40 inches height limit – see our height restrictions page.